There are many times during the ebb and flow of the capital markets that specific commodities take on a large global role and drive the direction of other assets. Commodities in generally play a crucial role in this dynamic where the correlation of the performance between stocks and commodities or currencies and commodity increases. Energy prices especially play a very important role in the general direction of currencies and assets, as they are the engine and in some case the backbone of many economies. When prices move in tandem with one another, they are generally considered highly correlated. Correlation measures the dependence of the performance of two or more assets, and provides a correlation coefficient that describes this relationship. For example, a correlation of 1, means that two assets move perfectly in tandem. A correlation of -1, means that two or more asset move in opposite direction. Correlation coefficients above 70 or below -70 are generally considered robust. During the first two months of 2016, there seems to have been a pronounced increase in the correlation between crude oil prices and the S&P 500 index. These two assets have appeared to move in lockstep for most of the year. The energy sector makes up approximately 6.5% of the S&P 500 down from 8.5% a year ago. The change has come from the decline in values of the energy sector. So a decline in the price of oil, has led to the decline in the prices of energy companies, which has weighed on the S&P 500 index and pushed prices lower. 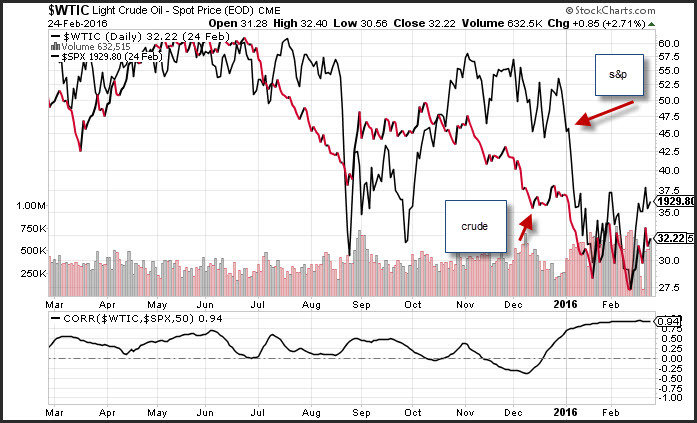 The correlation between the S&P 500 index and crude oil has increased to 94% climbing from 75% at the beginning of 2016. The correlation between the two asset will increase and decrease over time. To find a robust correlation, the 50-day changes in the price of both crude oil and the S&P 500 index were used. The chart also depicts a picture of prices that are experiencing similar performance. In essence, if you have gauge of where you believe crude oil prices are going, you probably have an idea of where the S&P 500 will move. Stocks are not the only assets that move in tandem with crude oil. There are many countries that derive a lot of their GDP from crude oil. Canada is one example, as the country has a great deal of reserves as well as many national oil companies. The current 50-day correlation between WTI crude oil and the USD/CAD currency pair is -35%, but it has been as low at -95% in 2016 and has just recently seen an uptick. It appears in 2016 crude oil has been a huge drive of both the currency markets as it relates to the Canadian dollar as well as the S&P 500 as it continues to drive the energy sector.